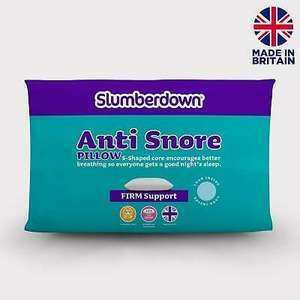 Slumberdown Anti Snore Pillow. Snoring can not only have a big impact on your sleep but your partners too. That’s why Slumberdown, has created the Anti snore pillow, specifically to help relieve the symptoms of snoring. I find that if I strap one of these to each ear I can't hear the wife's snoring. Bought one of these a while ago. It does not work.